Prominent Sydney art collector Dr Colin Laverty has launched two new exhibitions at Charles Darwin University’s Northern Editions gallery. The two exhibitions, Balgo: new etchings and glass and Bidyadanga: new screenprints, feature limited edition prints by some of Australia’s most acclaimed Indigenous artists including Eubena Nampitjin, Boxer Milner and Helicopter Joey Tjungurrayi from Balgo and Jan Billycan, Daniel Walbidi and Alma Webou from Bidydanga in Western Australia. Talented emerging artists from both communities also feature prominently alongside their senior counterparts. Artist Philomena Baadjo, representing Warlayirti Artists at the opening, commented on the importance of senior and emerging artists working together. “Our old people are getting weak and it’s up to our young people now to learn, keep culture going and pass on the stories,” she said. More than 200 people joined the opening day celebrations at the weekend including collectors, dealers, art lovers, artists, writers, academics and curators from across the country. Manager of Northern Editions, Emma Fowler-Thomason, said she anticipated both shows would continue to attract considerable interest. 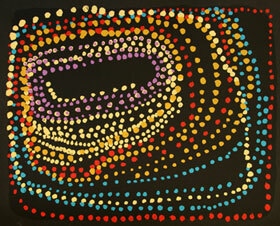 “Balgo and Bidydanga are two of Australia’s most vibrant and dynamic art-producing communities. The high regard for their artwork is evident in the strong attendance at the opening,” she said. 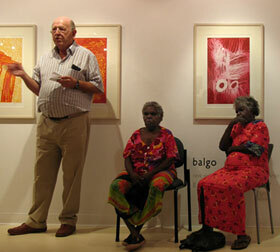 In September 2006 CDUs Printmaking Technician and sessional lecturer, Bobbie Ruben, travelled to Short Street Gallery in Broome to work with the Yulparitja artists for five days. It was the first time that these artists from Bidyadanga community had ventured into the printmaking medium and with remarkable results. In late October Northern Editions printmakers Trent Walter, Jacinta Numina-Waugh, Sarah Dudley and Ulrich Kuehle went to Balgo to work with 11 artists. Warlayirti Artists began printmaking in 1999 when a workshop was conducted by Northern Editions with artists from the region. Dr Colin Laverty has been a strong supporter of Indigenous artists for many years and has created an important collection of artwork from both Balgo and Bidyadanga artists. Northern Editions has been supporting Indigenous printmaking since 1993 and is now the longest established producer, publisher and retailer of limited edition fine art prints in northern Australia. The two exhibitions Balgo: new etchings and glass by Warlayirti Aritsts and Bidyadanga: new screenprints have been launched to coincide with the Darwin Festival and 2007 Telstra Art Award. The exhibitions are open to the public from 10am to 5pm weekdays at the university’s Casuarina Campus. To view the exhibitions online visit http://northerneditions.com.au/exhibitions/CurrentExhibitions.htm. A map of the Casuarina Campus is located at www.cdu.edu.au/campusmaps. For further enquiries contact Ms Emma Fowler-Thomason on (08) 8946 6325 or northern.editions@cdu.edu.au.